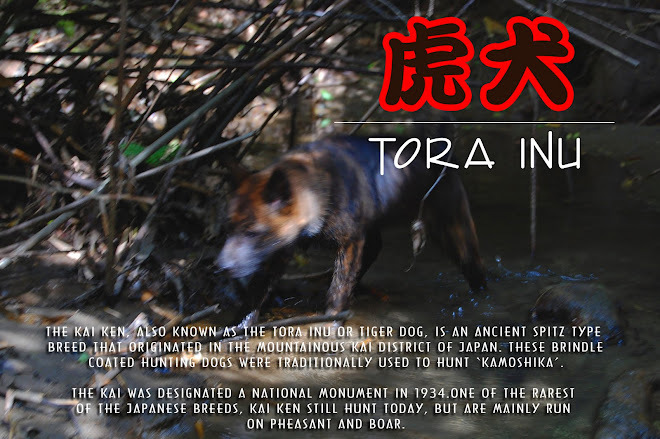 Kai Ken: The Tora Inu: All's Well? Well Haru was actually lactating, which my wife was fascinated by. The swelling's about 70% gone. It seemed to be bothering Haru a bit, and she was a bit whiny and didn't have much of an appetite for a couple days. She's back to her old self, scarfing down anything we give her. She's an extremely food motivated dog. At present she's eight and a half months old, but her weight and growth seem to have pretty much flattened out. She will probably put on a few more pounds of muscle during the coming months, but right now she's still weighing in at around 13 kilograms. We have an very annoying issue in the house at the moment. We haven't been able to pinpoint the culprit, but it seems someone is getting confused about where the toilet is. Seems it's one or more of the cats, and not Haru. As luck would have it, our serial pee'er is going to work in front of a little alcove that the fridge is in. Fridge is heavy= all the urine runs under the fridge. Very annoying to clean up. It happened a few days in a row, so I've actually fenced off the area so no one can get in. The jury's still out on whether that will work as last night someone peed in front of the AV rack in the living room instead. Well it's a beautiful day, and aside from a little work I have in Tokyo tonight, the next two days are mine. I read that squirting a bit of lemon on areas where cats are urinating can help to keep them from urinating in that area. Of course they might just choose another spot to urinate on that isn't scented by lemons.